The flag of Székely Land voted by the Szekler National Council. The Székely Land or Szeklerland (Hungarian: Székelyföld, pronounced [ˈseːkɛjføld]; Romanian: Ținutul Secuiesc (also Secuimea); German: Szeklerland; Latin: Terra Siculorum) is a historic and ethnographic area in Romania, inhabited mainly by Hungarians. Its cultural centre is the city of Târgu Mureș (Marosvásárhely), the largest settlement in the region. Székelys (or Szeklers), a subgroup of Hungarians, live in the valleys and hills of the Eastern Carpathian Mountains, corresponding to the present-day Harghita, Covasna, and parts of Mureș counties in Romania. Originally, the name Székely Land denoted the territories of a number of autonomous Székely seats within Transylvania. The self-governing Szekler seats had their own administrative system, and existed as legal entities from medieval times until the 1870s. The privileges of the Székely and Saxon seats were abolished and seats were replaced with counties in 1876. Along with Transylvania and eastern parts of Hungary proper, Székely Land became a part of Romania in 1920, in accordance with the Treaty of Trianon. In August 1940, as a consequence of the Second Vienna Award, the northern territories of Transylvania, including Székely Land, were ceded to Hungary, under Third Reich auspices. Northern Transylvania came under the control of Soviet and Romanian forces in 1944, and were confirmed as part of Romania by the Paris peace treaties, signed after World War II, in 1947. Under the name Magyar Autonomous Region, with Târgu-Mureș as capital, parts of Székely Land enjoyed a certain level of autonomy between 8 September 1952 and 16 February 1968. There are territorial autonomy initiatives with the aim to obtain self-governance for this region within Romania. Transylvania was populated by Thracian peoples in the First Iron Age. The area received a large influx of Scythians from the East in the first half of the first millennium BC. The Celts appeared in Transylvania in the La Tène period (c. 4th century BC). Dacian culture presence in southeastern Transylvania is marked by discoveries such as the flagship hoard Sâncrăieni (Harghita county) or Dacian fortresses in Covasna county (Cetatea Zânelor) or Jigodin (Harghita county). Dacian Kingdom led by Decebal was taken after two wars, in 106 AD by the Roman Empire under the emperor Trajan, who began organizing the new Roman province of Dacia. Southeastern Transylvania was included in the provinces of Dacia Porolissensis, Dacia Apulensis and Meuse and fortified with numerous camps such as those at Inlăceni ( Praetoria Augusta) and Sânpaul (Harghita county) Breţcu (Angustia) and Oltenia (Covasna county) or Brâncoveneşti and Călugăreni (Mureș county). After the fall of Roman Dacia, present-day territory of Szeklerland became part of the Thervingi kingdom "Gutthiuda". The migration of the Huns from the east pressured most of the German tribes to leave. In the Battle of Nedao the East Germanic Gepids defeated the Huns and founded Gepidia in the territory of present-day Transylvania. The territory of Szeklerland was part of the Avar Khaganate. During this period, Avar and Slavic groups migrated into Transylvania. From around 900 to 1526 the area was under the direct control of the Hungarian state. The Szeklers presumably settled in Transylvania in the 12th century from present day Bihar and Bihor counties. From the 12th and 13th centuries, the Székely Land enjoyed a considerable but varying amount of autonomy, first as a part of the Kingdom of Hungary, then inside the Principality of Transylvania. The autonomy was largely due to the military service the Székely provided until the beginning of the 18th century. The medieval Székely Land was an alliance of the seven autonomous Székely seats of Udvarhely, Csík, Maros, Sepsi, Kézdi, Orbai and Aranyos. The number of seats later decreased to five, when Sepsi, Kézdi and Orbai seats were united into one territorial unit called Háromszék (literally Three seats). Due to the Ottoman conquest Transylvania became a semi-independent polity. From the end of the 17th century, Transylvania became part of the Habsburg Monarchy (later Austrian Empire), and governed by imperial governors. In 1867, as a result of the Austro-Hungarian Compromise, Transylvania become an integral part of the Kingdom of Hungary, within Austria-Hungary. In 1876, a general administrative reform abolished all the autonomous areas in the Kingdom of Hungary and created a unified system of counties. As a result, the autonomy of the Székely Land came to an end as well. Four counties were created in its place: Udvarhely, Háromszék, Csík, and Maros-Torda. (Only half of the territory of Maros-Torda originally belonged to Székely Land.) The isolated Aranyosszék became a district of Torda-Aranyos county. In December 1918, in the wake of the First World War, Romanian delegates from throughout Transylvania voted to join the Kingdom of Romania. There was an attempt in Székelyudvarhely to found a "Székely Republic" on 9 January 1919; however, its creation was unsuccessful. In 1920, by the Treaty of Trianon, Transylvania along with further territories was officially ceded to the Kingdom of Romania. The Romanian language officially replaced Hungarian in the Székely Land, but Székely county boundaries were preserved, and Székely districts were able to elect their own officials at local level and to preserve Hungarian-language education. After 1930, the Romanian authorities began to Romanianize the Hungarian population of Székely Land. ; the presence of minorities in political life was repressed. The election of Hungarians was consistently nullified. The place-names were subjected to Romanianization. The minority languages were excised from official life and the local authorities were mostly led by appointed ethnic Romanians. In 1940, as a result of the Second Vienna Award, Northern Transylvania became part of Hungary again; this territory included most of the historical Székely areas. Hungarian authorities subsequently restored the pre-Trianon structure with slight modifications. Ion Gigurtu's antisemitic laws, the Romanian version of Nuremberg Laws, were replaced by Hungarian ones. The Jews of the Székely Land were subjected to particularly harsh treatment. These individuals had their citizenship status reviewed, many of them being detained. In Csíkszereda (Miercurea Ciuc), dozens of families were rounded up and expelled. The men in the area were drafted into forced labor battalions. For example, 1,200 Jewish males of Marosvásárhely (Târgu Mureș) were conscripted between 1941 and 1944; over half died in Ukraine, Poland and Hungary. However, despite discrimination and many casualties, most of the community lived in relative safety until the March 1944 occupation of Hungary by Nazi Germany. A conference devoted to the concentration of Jews in the Székely Land was held on 28 April 1944; it covered the counties of Csík, Háromszék, Maros-Torda and Udvarhely. The area's Jews were ghettoized in Szászrégen (Reghin), Sepsiszentgyörgy (Sfântu Gheorghe) and Marosvásárhely. Roundups began on 3 May 1944 and were completed within a week. The Hungarian authorities actively participated in the crimes of the Nazis. The Jews ghettoized at Sepsiszentgyörgy were later sent to Szászrégen, whence on 4 June 1944, 3,149 were boarded on a train bound for the Auschwitz concentration camp. Three transports left Marosvásáhely for Auschwitz: on 27 May, 30 May and 8 June 1944; altogether, they carried 7,549 Jews. Székely Land as envisaged by the autonomy supporters based on the historical Székely seats. On 12 September 1944, the Second Vienna Award was voided by the Allied Commission through the Armistice Agreement with Romania, and the Romanian-Soviet forces seized the area in Autumn 1944; however, the Romanian administration was expelled from these territories in October due to the activities of the Romanian paramilitary groups created in the area to avenge the atrocities committed by the Hungarians against the Romanians during the Hungarian rule in Northern Transylvania. For instance, the so-called Iuliu Maniu Guards terrorized the Szekler villages, butchered the local Hungarians by axe and hatchet and operated a death camp in Feldioara. This paramilitary group was described as "a band of terrorist-chauvinistic criminals" by the Soviets. The USSR let the Romanian authorities back to the area in March 1945, and the Paris Peace Treaties officially returned Northern Transylvania to Romania. 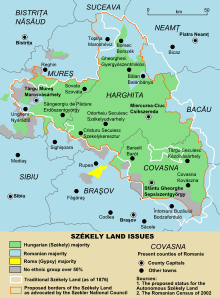 Following the Northern Transylvania's return to Romania after World War II, a Magyar Autonomous Region was created in 1952 under the Soviets' pressure,, which encompassed most of the land inhabited by the Székelys. In 1960, the region was renamed to Mureș-Magyar Autonomous Region. It was abolished in 1968, when Romania, following an administrative reform, returned to its traditional local administrative system based on counties. Roughly speaking, present-day Harghita County encompasses the former Udvarhely and Csík, the latter including Gyergyószék; Covasna County covers more or less the territory of the former Háromszék; and what was once Maros-Torda is mostly part of present-day Mureş County. The former Aranyosszék is today divided between Cluj and Alba counties. Nicolae Ceaușescu got to power in 1965. For the next couple of decades, due to the Romanianization efforts, a large number[quantify] of ethnic Romanians settled in Székely Land. Those Székely Hungarians who possessed degrees were subjected to resettlement. In March 1990, the city of Târgu Mureș witnessed violent clashes between ethnic Romanian and Hungarian groups. After the fall of communism, many[who?] 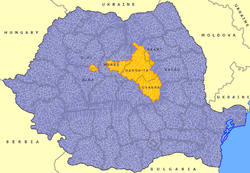 hoped that the former Magyar Autonomous Region, abolished by Nicolae Ceauşescu's regime, would soon be restored. This did not happen; however, there are Székely autonomy initiatives and further efforts from Székely organisations to reach a higher level of self-governance for the Székely Land within Romania. On 2 February 2009, Romanian President Traian Băsescu met the Hungarian President László Sólyom in Budapest and discussed the issues of minority rights and regional autonomy. Băsescu stated "The Hungarian minority will never be given territorial autonomy." In 2014, the UDMR and the Hungarian Civic Party had a joint autonomy proposal for Szeklerland but the Szekler National Council also possessed its own suggestion. In 2016, Hans G. Klemm, the United States Ambassador to Romania, together with other local officials, were pictured with a Szekler flag during his visit to Szeklerland. The photo was posted by the mayor of Sfântu Gheorghe on Facebook. The reactions of the politicians in Bucharest were turbulent. In a response Klemm affirmed that the only two flags that are important to him, as a diplomat, are the U.S. and the Romanian ones. Article 1 of the Romanian Constitution defines the country as a "sovereign, independent, unitary and indivisible national state." It has often been argued[by whom?] that, as a result of this provision, any ethnic-based territorial autonomy, including that of the Székely Land, would be unconstitutional. The Supreme Council of National Defence of Romania declared that an autonomy of the so-called Székely Land would be unconstitutional. In 2002 the estimated ethnic composition of Székely Land (Mureș, Covasna and Harghita counties) consisted of Hungarians (61%), Romanians (33%), Germans (3%) and Roma (3%). The area forms a Hungarian ethnic enclave within present-day Romania. The population of historical Székely Land (according to the 2002 census) is 809,000, 612,043 of them Hungarians, accounting for 75.65% of the total. The Hungarians represent 59% of the populations of Harghita, Covasna and Mureș counties. The percentage of Hungarians is higher in Harghita and Covasna (84.8% and 73.58% respectively), and lower in Mureș County, not all of which falls inside the traditional region (37.82%). According to the 2011 official census, 609,033 Hungarians (56,8%) live in the counties of Covasna, Harghita and Mureș (out of a total population of 1,071,890 inhabitants). In Mureș county the Romanians are the most numerous (52.6%), while in the counties of Covasna and Harghita, the Hungarians make up the majority (71.6% and 82.9%). The 2011 census compared to the data of the previous census (2002) also shows that the Romanian ethnic ratio in Szeklerland has been decreasing (due to emigration). Târgu Mureș is the home for the largest community of Hungarians in Romania (57,532 in 2011), but the town itself has Romanian majority (66,943 out of 127,849 inhabitants). Important centers of the Székely Land are Târgu-Mureş (Marosvásárhely), Miercurea Ciuc (Csíkszereda), Sfântu Gheorghe (Sepsiszentgyörgy), and Odorheiu Secuiesc (Székelyudvarhely). The exact territory of present-day Szeklerland is disputed. The boundaries of the historical Székely seats and the present-day administrative divisions of Romania are dissimilar. According to Minahan its territory is an estimated 16,943 square kilometres (6,542 sq mi). The autonomy proposal of the Szekler National Council consists of about 13,000 km2. This size is close to the extent of the historical Székely Land. However, it does not contain the region of Aranyos Seat. The UDMR's autonomy project covers a slightly bigger territory. It includes the whole territories of Mureș, Harghita, and Covasna counties. The Székely ice hockey team Sport Club of Csíkszereda, with mainly home trained, local players (Székelys), plays simultaneously in the MOL League (Hungarian League) and in the Romanian Ice Hockey Championship. Starting with the season 2010/2011 the Sport Club ice hockey team participated at the championships under the name HSC Csíkszereda and that year it won its first MOL League title as well. The team's main achievements so far: The Romanian Championship (fifteen times winner): 1949, 1952, 1957, 1960, 1963, 1997, 2000, 2004, 2007, 2008, 2009, 2010, 2011, 2012, 2013. The Romanian Cup (ten times winner): 1950, 1952, 1995, 2001, 2003, 2006, 2007, 2010, 2011, 2014. Pannonian League (one-time winner): 2004. MOL League (one-time winner): 2011. The majority of the Romanian men's national ice hockey team consist of Székely players. The national team are ranked 28th in the 2010 IIHF World Rankings and currently compete in Division IIA. Fortified church of Aita Mare. ^ "Symbol of a Struggle". The New York Times. 6 February 2013. Retrieved 21 October 2015. ^ a b Sherrill Stroschein, Ethnic Struggle, Coexistence, and Democratization in Eastern Europe, Cambridge University Press, 2012, p. 210 Cited: "Székely, a Hungarian sub-group that is concentrated in the mountainous Hungarian enclave"
^ Kurti, Laszlo (2001). The Remote Borderland. State University of New York Press. p. 33. ^ Hall, Richard C. (2014). War in the Balkans. Santa Barbara, California: ABC-CLIO, LLC. p. 249. ^ "The Avalon Project : The Armistice Agreement with Rumania; September 12, 1944". avalon.law.yale.edu. ^ Voievodatul Transilvaniei. Retrieved 10 August 2015. ^ ""capitalis sedes" - Cutare Google". Retrieved 10 August 2015. ^ "Transylvania". Encyclopædia Britannica. Retrieved 2008-06-26. ^ Sándor Bíró, The Nationalities Problem in Transylvania, 1867-1940: A Social History of the Romanian Minority Under Hungarian Rule, 1867-1918 and of the Hungarian Minority Under Romanian Rule, 1918-1940, Social Science Monographs, 1992, p. 486. ^ Holly Case (5 May 2009). Between States: The Transylvanian Question and the European Idea during World War II. Stanford University Press. pp. 285–. ISBN 978-0-8047-8755-0. ^ Kulish, Nicholas (2008-04-07). "Kosovo's Actions Hearten a Hungarian Enclave". The New York Times. Retrieved 2008-04-08. ^ "World protests back Székely autonomy". Archived from the original on 2015-04-17. Retrieved 10 August 2015. ^ "Romania: US Ambassador in Minority Group Flag Controversy". abcnews. 14 September 2016. Retrieved 19 September 2016. ^ AGERPRES. "US Embassy: Klemm ambassador to all of Romania; MAE: Visiting diplomats need to consider." www.agerpres.ro. ^ "Proiectul de autonomie a "Ţinutului secuiesc" - iniţiativă separatistă sau un pas pe calea unei reale autonomii locale". BBC. BBC. Retrieved 8 May 2016. ^ Zsolt Árus. "The szeklers and their struggle for autonomy - SZNC - Szekler National Council". Archived from the original on 16 April 2013. Retrieved 10 August 2015. ^ "Rezultatele recensământului din 2011". ^ COMUNICAT DE PRESĂ 24 august 2012 privind rezultatele preliminare ale Recensământului Populaţiei şi al Locuinţelor – 2011 în judeţul Mureş (PDF) (Report) (in Romanian). National Institute of Statistics (Romania). 2012-08-24. p. 14. Retrieved 2015-04-04. ^ "Csíkszeredai Sportklub - A Short Historical Overview". www.sportclub.ro. Wikimedia Commons has media related to Székely Land. Wikimedia Commons has media related to Székely fortified churches in Transylvania.